In a nutshell this means that the Danish government wants to charge a fee for EVERY SINGLE MAGAZINE we order from outside the EU. And this is not just a NORMAL-SIZED fee but 160kroner added to each and every magazine. Now I am not a big magazine subscriber; however I do have a subscription to The New Yorker....you know, that magazine that has been around since the 1920s....the one that publishes works by folks like Vonnegut, Salinger, and Updike... the one that offers literary criticism and keeps quality literature in the hands of the masses. 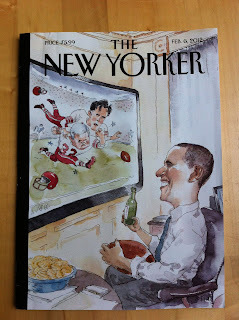 Yeah, THAT New Yorker. I received my renewal notification last week for The New Yorker and it will, as always, cost me about 600 Danish kroner to renew for another year (and that 600kroner gets me 47 issues a year). So each issue costs me about 13kroner. Now if the EU would like to show me a magazine that offers the same literary quality as The New Yorker, I would gladly consider it, but otherwise NO DEAL. The fact that a government which PRIDES ITSELF on education and "internationalisering" wants to add this kind of a TAX to PRINT LITERATURE from international publishers just astounds me. Usually I can find some kind of relevance and meaning in the enormous amounts of taxes and fees that the Danish government imposes on us.... in other words, I can see the bigger picture. But this??? This is 100% RIDICULOUS. I just need to figure out how to make my voice heard before this goes to a vote on April 1. I did try to get New Yorker on my Kindle and it was a no go. The New Yorker does not carry subscriptions overseas for data, unless that has changed. I don't know about iPad. Start sending money to Jess to send you one via snailmail every week... Eesh. It does seem contrary to their "internationalisering" policy and outrageously expensive. I agree with your fine print, also. Whoa...I had to get out the currency converter for this one, and yes, 30+ dollars per issue is INSANE! Ny dansk moms var på dagsordenen i Det Hvide Hus, afslører Thorning. Thorning mødte Obama fredag aften dansk tid, og mandag aften - mindre end 75 timer senere - lød det overraskende fra skatteminister Thor Möger Pedersen, at den omstridte moms nu foreløbig skulle »udskydes«. Announcement that Obama brought up the tax on non-EU magazines comes after tax minister said plan had been shelved to allow time for a study of its legality to be carried out US President Barack Obama asked PM Helle Thorning-Schmidt to ditch the controversial decision to charge VAT on magazines printed outside the EU.